of Popular Science with the fountain of Allegheny Square Plaza in the foreground. A Partial Eclipse of the Sun or Solar Eclipse, visible throughout most of North America, will occur Thursday Afternoon, 2014 October 23 between 3:37 and 7:52 p.m. EDT / 19:37 and 23:52 Coordinated Universal Time. This Solar Eclipse occurs on the eve of the 75th anniversary of the dedication of Pittsburgh's original Buhl Planetarium and Institute of Popular Science. The western portion of North America will receive the best view of this eclipse, while the eclipse occurs very close to sunset in the eastern part of the continent. Internet web-casts are the safest way to view a Solar Eclipse, and may be the only practical way for people in the eastern part of North America. In south suburban Pittsburgh, safe public viewing, free-of-charge, of this Partial Solar Eclipse will be displayed, via a live Internet web-cast, in a meeting room of the Mount Lebanon Public Library, located at 16 Castle Shannon Boulevard near Washington Road at the southern end of the Mount Lebanon Uptown Business District. This special event is co-sponsored by Friends of the Zeiss and the Mount Lebanon Public Library. Normally, Friends of the Zeiss would try to show the eclipse to the general public using a telescope on the Library grounds, weather-permitting. However, as the eclipse begins in the Pittsburgh region so close to sunset, regular telescope views of the eclipse are not practical. Hence, we are providing the public with an Internet web-cast of the event. An Eclipse of the Sun or Solar Eclipse occurs at the New Moon phase of the Moon, when the Moon comes between the Earth and the Sun and blocks out some or all of the light from the Sun on part of the Earth's surface. WARNING: Observing the Sun or a Solar Eclipse with a telescope, binoculars, or any other type of optical device should only be attempted by people who have received the proper training and possess the proper equipment to do so safely. Looking at the Sun or a Solar Eclipse without the proper training and special equipment would cause PERMANENT BLINDNESS INSTANTLY ! Blindness could come without pain, as there are no nerves in the eyes. 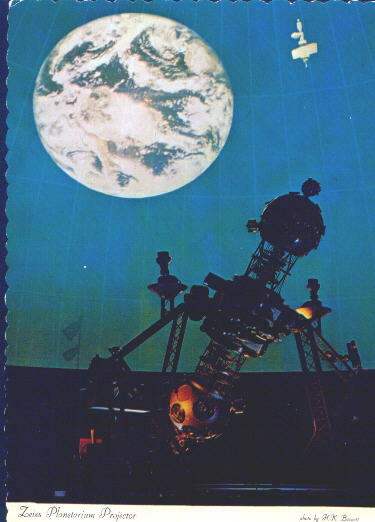 This Solar Eclipse occurs on the eve of the 75th anniversary of Pittsburgh's original Buhl Planetarium and Institute of Popular Science, America's fifth major planetarium with the historic Zeiss II Planetarium Projector, the first such projector to be placed on an elevator. The Solar Eclipse event at the Mount Lebanon Public Library will include a celebration of the Buhl Planetarium milestone. 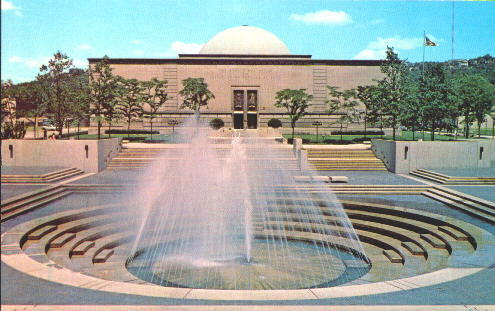 Friends of the Zeiss is a non-profit organization with the mission to promote Astronomy, Space, and related sciences as well as the history and preservation of the historic building, apparatus, and artifacts of Pittsburgh's original Buhl Planetarium and Institute of Popular Science. Electronic Mail >>> < solareclipse@planetarium.cc > or Telephone 412-561-7876.
of this article in the Quarterly Journal of the International Planetarium Society. Eastern Ohio college radio stations) 2014 Oct. 25. Pittsburgh's original Buhl Planetarium and Institute of Popular Science building. * "Wednesday Rundown: Celebrating the Birthday of the Original Buhl Projector." Essential Pittsburgh. WESA-FM 90.5 Pittsburgh 2014 Oct. 22. I attended that Library Solar Eclipse event, it was quite informative. You know the celebration of the Buhl Planetarium milestone was just fabulous guys!! I loved the big meeting room used for this event. Meeting Room was quite huge and near about 500 people gathered there very easily. Events are operated by agencies or organizers which they wanted to support and provide their customers with worthwhile and great parking space. Their main goal is to gain a successful and perfect event in that parking spaces they choose. The positive impression of special event parking software is to provide their customers how to make parking management successful. Supervising parking space to make it more conducive for organizing or hosting special events is very difficult but maintaining parking spaces is a different idea. In maintaining such one, special event parking software is taking the action providing harmonious and efficient positive results at the end. Different procedures should be followed and must be taking into consideration the various strategies on how to make smaller parking spaces become bigger.